The International Monetary Fund (IMF) has done it again. In an attempt to garner some press, the head of the IMF’s Western Hemisphere Department Alejandro Werner forecasted that Venezuela’s annual inflation rate will reach 1,000,000% by year’s end. By my calculations, this inflation forecast implies that the exchange rate will reach 923 million VEF/USD by December 2018. To put this into context, the exchange rate at the end of July was 3.3 million VEF/USD, and at the end of June it was 3.1 million VEF/USD. The IMF’s most recent inflation forecast is, to put it mildly, stunning. It is also bogus. No one can forecast the course or duration of a hyperinflation with any degree of accuracy. Never mind. The IMF just keeps on making forecasts of Venezuela’s inflation. And the press keeps on uncritically reporting the IMF’s bogus numbers as if they were credible. The IMF and the press are clearly unaware of the fact that hyperinflation can be measured, and measured very accurately, but it cannot be forecasted. To get a handle on the IMF’s production of bogus forecasts for Venezuela’s inflation, consider that, during the past year and a half, the IMF has reported a variety of numbers for the annual inflation rate in Venezuela. None of the IMF’s numbers can be replicated. This is a problem -- one that renders all of the IMF’s inflation numbers unusable because, among other things, they fail to pass the scientific smell test. The following is a catalogue of the IMF’s inflation numbers for Venezuela that have been reported since September 2016. These disclaimers are laughable. No one has ever been able to accurately forecast the course or the duration of an episode of hyperinflation. But, that hasn’t stopped the IMF from offering up inflation forecasts for Venezuela that have proven to be wildly inaccurate. And, for an example of the absurdity of the IMF’s projections, just consider its WEO year-end forecasts for 2018 and 2019. The values for both years are exactly the same: 12,824.6%. These forecasts are blatantly absurd. After all, the current measured annual inflation rate is already by my calculations 33,151%. And the same forecasts for both 2018 and 2019 contain a touch of spurious accuracy to boot: note the decimal point. And now we have a new forecast for 2018, a whopping 1,000,000%. So, forget the IMF’s forecasts of Venezuela’s hyperinflation. They are a prime example of junk science. Even though accurate forecasts of hyperinflation are not possible, very accurate measurements of hyperinflation can be made. Just how is this done? The most important price in an economy is the exchange rate between the local currency – in this case, the bolivar – and the world’s reserve currency, the U.S. dollar. As long as there is an active black market (read: free market) for currency and the data are available, changes in the black market exchange rate can be reliably transformed into accurate measurements of countrywide inflation rates. The economic principle of purchasing power parity (PPP) allows for this transformation. And the application of PPP to measure elevated inflation rates is rather simple. During periods of elevated inflation, PPP is the proper theory to use for measurement. Indeed, PPP holds during episodes of hyperinflation, and it holds very tightly. Beyond the theory of PPP, the intuition of why PPP represents the ‘gold standard’ for measuring inflation during hyperinflation episodes is clear. All items in an economy that is hyperinflating are either priced in a stable foreign currency (the U.S. dollar) or a local currency (the bolivar). If they are bolivar prices, they are determined by referring to the dollar prices of goods, and then converting them to local bolivar prices after checking with the spot black-market exchange rate. Indeed, when the price level is increasing rapidly and erratically on a day-by-day, hour-by-hour, or even minute-by-minute basis, exchange rate quotations are the only source of information on how fast inflation is actually proceeding. 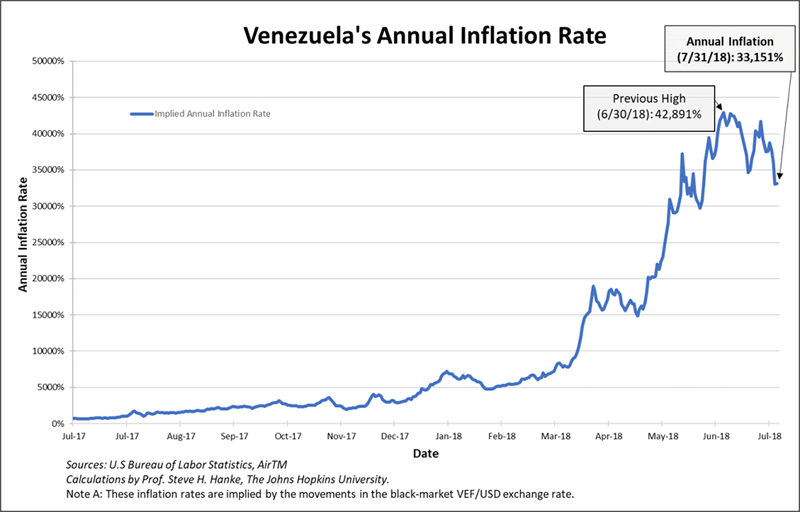 That is why PPP holds and why I and my Johns Hopkins-Cato Institute Troubled Currencies Project team can use high-frequency (daily) data to calculate Venezuela’s annual inflation rate. Venezuela’s hyperinflation, which has been roaring away since November 2016, is depicted in the chart below. Today (7/31/18), the annual inflation rate for Venezuela sits at 33,151%. This accurate MEASUREMENT means that Venezuela is now experiencing the 23rd most severe episode of hyperinflation in history.